The 40mm individual single-shot grenade launcher is one of modern infantry fireteam’s core pieces of firepower. They provide rapid explosive firepower at ranges greater than hand grenades but less than infantry mortars. During the Vietnam War, they were called the “squad leader’s artillery .” While the United States pioneered the use of this class of weapon with the M79 single-shot grenade launcher and later XM148 and M203 underslung grenade launchers, Germany’s Heckler & Koch GmbH has come to dominate this market. But how did the German designs end up replacing the American ones? Are there any real competitors who might challenge H&K’s reign in this market niche? H&K’s first entry into this market was the HK69 , a 40mm single-shot standalone grenade launcher designed as an alternative to the M79. More ergonomically modern, it featured a telescoping metal stock and thumb safety instead of the M79’s shotgun-style safety and wooden stock. It also weighed slightly less than the M79—but still a hefty 5.75 pounds due to its all-steel construction. The HK69A1 was adopted by the German Bundeswehr in the 1980s as the Granatpistole, or GraPi in short. It also has been adopted by a myriad of other nations—notably as late as 2002 (by Finland), when the next generation of H&K grenade launchers was already coming out. While the HK69 was a moderate success in the 1980s, the M79 was already being replaced by the M203, an underslung grenade launcher in American service that allowed a grenadier to carry a full-length rifle in addition to a grenade launcher. H&K’s answer to the M203 was the HK79, a HK69 adopted into underslung form. 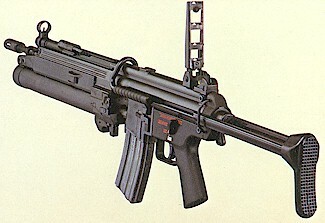 This was paired with a G3 , HK33, or G41, although it could be adapted to work with other platforms. Such a configuration were called the “Tactical Group Support” (TGS) variants of their parent rifle. The HK79 differed from the M203 and later H&K grenade launchers in that it swung open downwards. In some ways it was a HK69 turned upside down and given revised controls. Also atypical for an underslung grenade launcher, the sights were placed on the right side of the rifle (although there was the option to mount a ladder sight just front  of the standard H&K diopter rear sight). The sights might have been placed there to encourage the operator to tightly brace the stock into their body before firing a grenade. However, the HK79 also had weight issues—its all-steel construction made the entire TGS rifle package extremely front heavy. 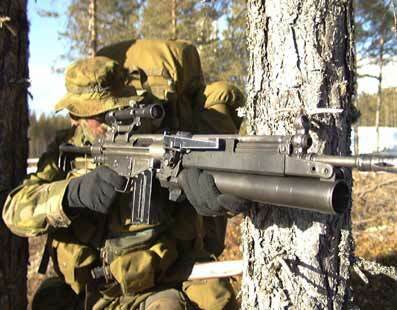 It was adopted by a few nations, notably Norway for their AG3-F1 rifles . H&K grenade launchers really came into the vogue when H&K designed a new underslung grenade launcher for their new G36 rifle in the 1990s, to replace the HK69A1 “GraPi.” As with the rifle itself, the AG36 was designed to use polymer and aluminum to reduce weight. The swing-under action of the HK79 was switched out for a swing-right action, to make loading grenades more ergonomic for most users. 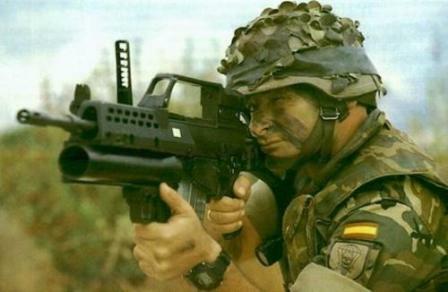 It proved a success in its role as a replacement, reaching full adoption in the Bundeswehr and being packaged with G36 export variants to other European countries such as Spain . Interestingly, the AG36 retains the right side ladder sight from the HK79. The AG36’s greatest strength proved to be its adaptability. 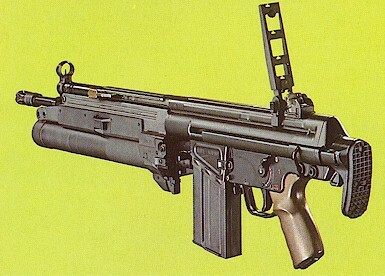 In 1995, H&K offered a variant for the British L85/SA80 rifle. They adopted it as the L17A2, but it only began to be issued when the L85A2 program commenced in 2002, with the designation changed to L123. The L17A1 was a variant put on the UK Special Forces’ Diemaco C8 carbines—in lieu of the American M203 which was traditionally paired with an AR-15 variant. What marks the UK’s adoption as special is it ended an almost thirty-year search for a proper grenade launcher module for the standard British service rifle. Before, many grenade launchers were trialed  on the L85, including the M203 and the HK79. The AG36’s next big sale was replacing the M203 itself in U.S. Army service, as the M320. The primary improvement the M320 offered over the M203 was the swing-right action that allowed the M320 to chamber longer rounds (including Raytheon’s 40mm “mini-missile). It also had a simpler safety, the ability to safely restrike the primer of a grenade and could be configured as a standalone module. As a standalone module, the M320 is significantly lighter than the HK69A1. The Army adopted the M320 in 2008, and the Marine Corps followed in 2017. 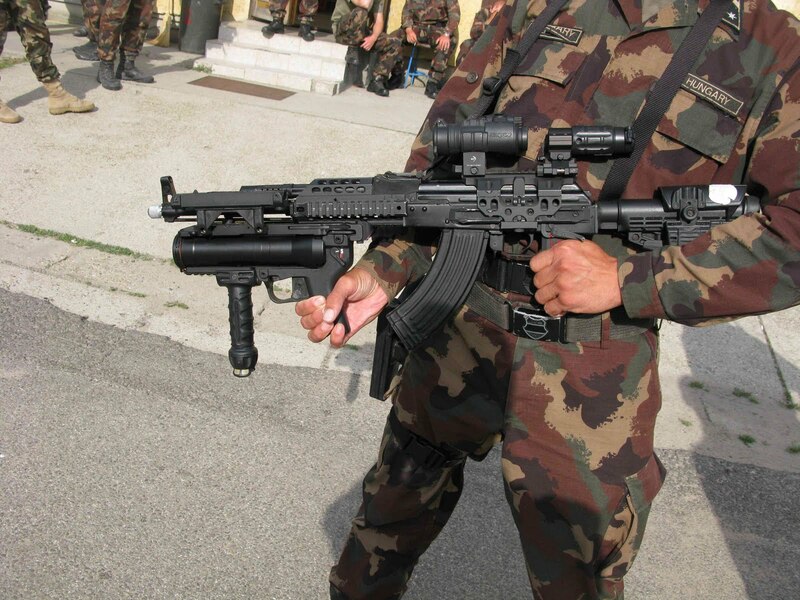 The Hungarian Army has also adopted  the M320 for their AK rifles. In addition to the M320, H&K’s markets their AG36 derivatives under the name AG-C. Unlike the AG36 and L123, these are designed to simply mount on a bottom picatinny rail, similar to the M320. These have seen wide adoption by NATO forces, including the Netherlands on the C7NLD rifles, and Norway on their HK416s. The recent French adoption of the HK416F is also coming with another AG-C variant , called the HK2969F. This marks the departure from the French tradition of using rifle grenades (as supported by the MAS-49 and FAMAS) in favor of underslung 40mm grenade launchers. With the French adoption of an H&K grenade launcher, the company’s grenade launchers arm practically every major military in NATO. Italy, Turkey, and Poland are some of the only countries to buck the trend, fielding grenade launchers developed in their own countries. H&K’s success was likely due to a well-designed product and smart sales—as well as a lack of a real competitor on the market. If one looks at the British trials that resulted in the adoption of the L17, most domestic competing designs were developmentally immature compared to the AG36, and existing mature designs didn’t have all the features the UK wanted. H&K came onto the scene at the right time with a “better mousetrap,” and reaped the rewards.